Experience remarkable Middle Eastern hospitality at Ramada Chelsea Hotel Barsha, ideally located in the New Dubai Business Hub. This 4-star property is one of the few located near the popular Mall of Emirates and Media City and combines business with leisure, and luxurious facilities. This award-winning property offers 299 elegantly-furnished rooms, each suited to a variety of travellers. Guests can make use of the facilities by taking a dip in the outdoor swimming pool, relaxing on the sun terrace, exploring the in-house gym, sauna and steam room or unwinding at the spa. 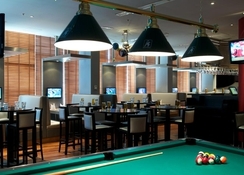 When it comes to dining, Ramada Chelsea Hotel Al Barsha features five fantastic restaurants and bars, where guests can indulge in a variety of cuisines and drinks. 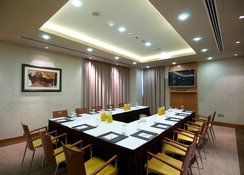 The hotel is located in Al Barsha, the business hub of New Dubai. The nearest beach is about 5km from the hotel, while Palm Jumeirah Island is about 7.5km. Centrally located, Sheikh Zayed Road is only 500m away, Ski Dubai and Mall of the Emirates are 15-minutes on foot, and Wild Wadi Water Park is hardly 5km from the hotel - ideal for fun-seeking families. There are numerous restaurants and cafes in the neighbourhood to explore too. The Dubai International Airport is 26km from the hotel. 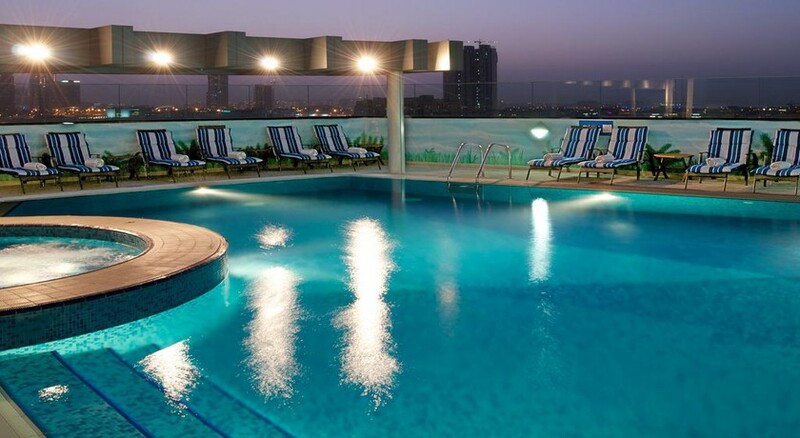 Ramada Chelsea Hotel Al Barsha features 299 luxurious rooms divided into 277 Deluxe Rooms, 11 Junior Suites and 11 Executive Suites spread across 13 floors. Rooms are designed with a la mode facilities and amenities to cater to smart and modern travellers. 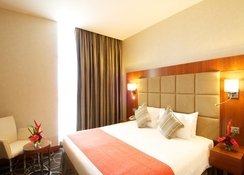 Guestrooms are furnished with air conditioning, TV with satellite, safe deposit, electric kettle, mini bar, en-suite bathroom with bath amenities, hairdryer, iron & iron board, DVD player, Wi-Fi, phone and work desk. Junior and Executive suites come with extra amenities, including a separate living room. 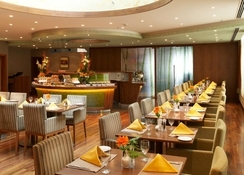 Seasons – All Day Dining is the main restaurant in the hotel, which is open 24 hours and serves breakfast, lunch and dinner in buffet style. 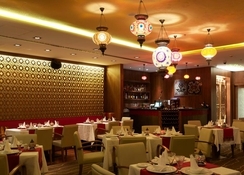 Spice Restaurant serves selected Indian curries with lively entertainment between 12:30am – 3pm & 7pm – 1am, while Mezz Restaurant serves exquisite Arabic cuisine from 5pm to 3am, and Szechuan Palace Restaurant serves authentic Chinese cuisine between 12:30am – 3pm & 7pm – 12am. Centre Circle is Ramada Chelsea's lively sports bar which serves a wide collection of cocktails and other alcoholic drinks — it opens between 12pm and 3am. The hotel houses an outdoor swimming pool where you can relax and soak up the sunshine — parasols and loungers are complimentary, and drinks are served around the pool. Should you want to pamper yourself, the signature spa offers a wide selection of beauty and therapeutic message and hair & beauty salon. 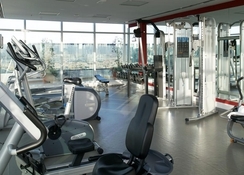 For guests that want to stay active, there is a swanky gym with Jacuzzi, sauna and steam room. There are numerous entertaining events and programs in the evening, along with live music. Other activities include darts, billiards and table tennis. American Express, Visa, MasterCard are accepted.